It's been a few years since I have gone to Burning Man, and I'm getting old enough that I wonder if I'm ever going to motivate to return. But I move in Burner circles and I still have a keen interest the event. Indeed, my very first post on this blog was about Burning Man. When the Burning Man Organization announced the 2013 art theme Cargo Cult, I was immediately drawn into discussions of the choice and what it signified, and wanted to set my thoughts in order and blog them so they would be available to folks. For the reader unfamiliar with cargo cults: they are an amazing phenomenon. The story goes that during the Second World War the US built airbases on numerous small islands in the Pacific, many of them places with paleolithic civilizations which had experienced little or no contact with technological society up to that point. After the war ended, Americans abandoned the islands ... but the islanders then built fascimiles of airbases out of local materials, in hopes of luring the airplanes, with their useful cargo, back to the island. There's a lot more to it than that, of course, but that's the core of the tale. It's a story that makes a good symbol. I've alluded to it myself at work, talking about “cargo cult design”, borrowing from a talk by the physicist Richard Feynman, Cargo Cult Science. He used cargo cults as a metaphor for the kind of pseudoscience which offers charts and numbers and impressively scientific-sounding language without doing real science. Similarly, the organizers of Burning Man are turning to the cargo cult as a metaphor, offering a sly critique of technocratic consumer culture. Like the islanders, most of us are many steps removed from the Cargo that entirely shapes our lives. We don't know how it's made, where it's made, or how it works; all we can do is look beyond the sky and pray for magic that will keep consumption flowing. We feel sure our theme will attract many alien Visitors, and hope this will stimulate our planet's faltering economy. That has some bite, no? ... and that has a lot of bite as well; I cannot resist a dark little chuckle at that one. But notice how the cargo cult story provides such a seductive parable of the encounter between the modern and the paleolithic. We want this story so we can use it as a metaphor. 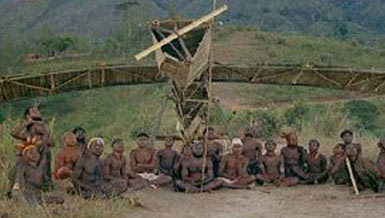 We need to stay wary of how the story of the cargo cult is a little too appealing. I'm told that there's a school of thought among anthropologists which holds that the formation of cargo cults in the first place springs in part from performing for the anthropologists who find it so fascinating. Plus the story connects to a bunch of stories we want to tell ourselves about the encounter between very different societies, stories we want to tell ourselves about Exotic Primitive Native People, stories that easily slide into racist ooga-booga cartoons. When does talking about cargo cults cross the line into ho ho, let us now laugh at those colorfully-dressed islanders with their silly superstitions, too stupid to know that you cannot make an airplane out of coconuts like Gilligan and the Professor, with all of the ugly bigotry that implies? ’E look like you an’ me. ’E tall man. ’E live long. 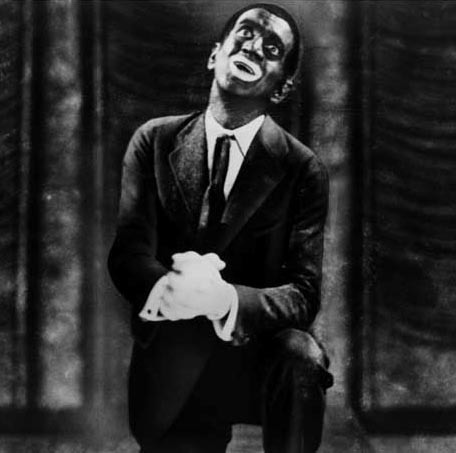 That's a little too close to the minstrel show for comfort. Now I don't want to suggest that Burners are a bunch of racist bigots who think Al Jolson performing in blackface is okay. That's obviously untrue. But Burner culture does include a lot of culturejamming remixing symbols from other cultures. Many folks would call that cultural appropriation. I'm a little wary of using that term, because some folks attach it to a critique which presumes that some groups “own” some manifestations of culture. That risks sliding into the Preservation Of Cultural Purity and I do not want to go there. 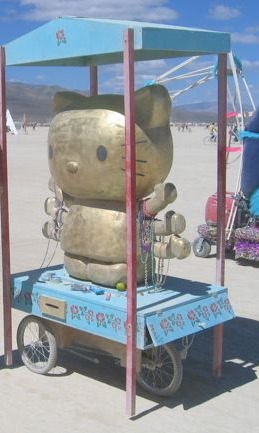 If that Hello Kitty icon is wrong, I'm not sure I want to be right; I include it in this post because it gave me a big smile when I first saw it on the playa. But many Burner examples of cultural appropriation are not as innocent or witty as that Hello Kitty icon. Consider the story of a Burners' event gone badly wrong just a few years back. Visionary Village — a loose group of artists and other young people who enjoy the annual Burning Man arts festival in Nevada — began routine publicity for a Burning Man-style “private event” at the Bordello on E. 12 Street in Oakland. The online flyer circulated on Tribe.net read: “GO NATIVE” in an Old West font set against a desert sun, and the dance party was advertised as a “fundraiser for the Native American Church.” Native-rights activists got wind of it and publicized additional text from the VisionaryVillage.org web site indicating four “elemental rooms” would be themed: “Water: Island Natives (Maori); Air: Cliff Natives (Anasazi); Earth: Jungle Natives (Shipibo); Fire: Desert Natives (Pueblo).” Ravers were offered a discount off the $20 door fee “if you show up in Native costume,” and the money would fund “neurofeedback research demonstrating causality between medicinal use [of peyote], improved brainwave patterns, and heightened mirror neuron activity in users.” The 140-year-old Bordello property abuts Interstate 880 and an ancient Ohlone Indian site dated to the 12th century B.C., which was also promoted. Native American activists showed up to that event, and there were some rightly embarassed White people. The Burning Man Organization does not have responsibility for that event. But it does present a notorious example of how Burner culture can be tone-deaf about these questions and present a face that people of color rightly regard as insulting and unwelcoming. So the BM Org needs to act responsibly in the context of that unwholesome aspect of Burner culture, a context which costs Burning Man the benefit of the doubt on the Cargo Cult theme. The Burning Man Org needs to respond to the way that Cargo Cult plays on a racist narrative about Primitive Natives and can be read as an invitation to a minstrel show. I feel certain that the Burning Man Organization doesn't mean it that way. But if they know that the theme will be read that way, as they should, then they are giving offense intentionally. If you give offense intentionally, that's an insult. It says to people of color that the Burning Man Organization does not care if Burning Man feels hostile to them. Burning Man is already overwhelmingly a White People Thing. The insult to people of color implicit in cultural appropriation is one of the big reasons why. That's a problem for an event which counts radical inclusion as the first of its foundational Ten Principles. I have to ask the Burning Man Organization, what's the plan? What do you intend with this theme? There are some pointed questions we could ask. Is the Burning Man Organization hinting that an icon of Ganesh at the front of a Burning Man theme camp is cargo cult Hinduism? Is the Burning Man Organization hinting that its own Cargo Cult theme is itself cargo cult anthropology? When I originally published this post a week ago, correspondents pointed to some important questions that I originally glossed over for the sake of brevity. This is a somewhat revised version of my post informed by those comments. As this is my preferred version, I'm putting it at this URL, which has been linked from several places. I don't want to misrepresent the shorter original post, which some people have already seen, so I have that archived for those who want to read it. Robotson links me and asks “what could possibly go wrong?”. Update: Caveat Magister on the Burning Blog has a long examination of the trickiness of the theme, Cargo Cult is a daring – and dangerous – theme. Get it right. It includes this telling aside. Burners who take “Cargo Cult” at its easiest, laziest interpretation – look at those crazy people who have bizarre beliefs and perform useless rituals – are inadvertently putting themselves in the cross hairs. Thanks for writing about this. As you and I have already discussed, the event does have issues with inclusion and with privilege denial ... but I feel like this Cargo Cult thing takes it to a new level. I mean, that "Melanesian informant" quote was just like ... seriously? I'm confused. You seem embarrassed by the quote, "’E look like you an’ me. ’E tall man. ’E live long," and compare it to a minstrel show. But that's a quote from a Melanesian, no? And it's your evaluation that Western 'progress' is the result of intellectual superiority. So you're the racist, right? Please correct my misreading of this. Honestly, I found the "cargo cult" theme to mostly be redundant. that's a quote from a Melanesian, no? Maybe. Given the context, it could easily be a winking fabrication of convenience. But even if the quote is authentic, the choice of quote, the choice of where and how to use it, and the choice to render it in dialect were all choices made by the Burning Man Org. So they are responsible for it. What did they choose? Something that expands our understanding of the myth of Frum, of the ideas and practices of the cargo cults, of the experiences of the speaker? No, the quote gives us only the flavor of the dialect. Even if it gives us the voice of an actual Melanesian, it is only as decoration, in a way reminiscent of minstrel show characters. That is so radically different from my intentions that I have no idea what in my post led you to that reading. "Is this theme working to expose the biases of our own western constructions of progress and civilization, satirizing how little we're actually able to do for ourselves in this modern age, or does it merely reassert a teleological notion that there should be a superior hegemonic way of doing things that we are failing to live up to, perhaps found in the classically western worship of a noble savage? Does this art theme help clarify our relationship to these discourses, or create confusion? Will the dialogue it provokes be helpful in aiding our understanding of our position as colonial subjects in a natural world being destroyed alongside indigenous lifeways? does comparing ourselves to the so-called primitive people cleverly subvert the dominant narrative or subtly reenforce it?" To those who suggest the author is somehow imposing their own western biases on the subject of the cargo cult phenomenon- i say, you have to consider the context of cultural appropriation that is frequently exhibited in new age circles as a reason for why this kind of analysis is not only valid but necessary for burners (who seem to be loath to self criticize when it comes to this subject) to consider. A critical intervention is necessary, if you please. i think it's entirely likely that the complexities will be lost on many, but actually it makes me kind of excited to want to go back and dress as a future anthropologist so i can hand out "cultural appropriation penalty cards" to folks dressed in offensively stereotypical native garb. It seems rather odd that you use the phrase "cultural appropriation" and then say that this piece of culture might actually be just a show put up to fool anthropologists. Because if it is just a show then Burning Man about Cargo Cults would not be "cultural appropriation" by Americans, it would be "cultural imperialism" by pacific islanders, but obviously then the power would be with non-Americans which of course can never happen. Also as a non-American, it seems you have some delusions of grandeur about the importance of Burning Man. As far as I can tell, nobody outside America knows about it and even most Americans who know about it think it's dumb. So they wouldn't be offending anyone, but just being stupid. This just makes you look very paternalistic and arrogant in your quest to look sensitive and accommodating. I linked to your thoughtful blog post on a petition that my theme camp just started. Thanks for your thoughts. 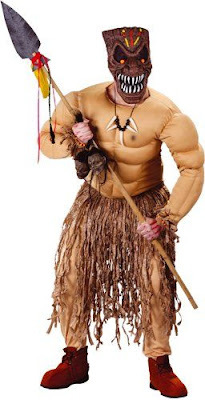 i think it's entirely likely that the complexities will be lost on many, but actually it makes me kind of excited to want to go back and dress as a future anthropologist so i can hand out “cultural appropriation penalty cards” to folks dressed in offensively stereotypical native garb. Now that is a fine project in the Burning Man spirit. I don't say that. I said that I have been informed that there are anthropologists who argue cargo cults “spring in part from performing for the anthropologists”. The argument, as I understand it, is that the interaction between cultures which produces the cult doesn't end with the departure of airfield-building GIs, but continues in the form of anthropologists (among other things), reïnforcing and subtly helping to shape its development. That jazz is a Black artistic tradition which has been supported and affected by the attention of appreciative White audiences does not make it only, or even primarily, a performance for Whites. Seen in that light, one could argue that the understanding of cargo cults in Feynman's metaphor is wrong. A cargo cult is not an effort to build an airfield which fails because of a lack of understanding; it actually works. After all, people from technological societies in airplanes bearing cargo do show up in the form of anthropologists! Thank you for correcting me. From now on I will only blog about questions of global significance. I don't quite get the point of referencing the "GO NATIVE" event. The author seems to be saying the Org "does not get the benefit of the doubt" because "some young people who enjoy... Burning Man" once hosted a private, unaffiliated event that involved egregious cultural appropriation. Is that fair? The GO NATIVE event is a relevant as an example of Burner culture. The Burning Man Organization is not responsible for that event. But BM Org it is responsible for acting in a context in which they know that people of color are alienated by Burner culture which has problems with cultural appropriation as exemplified by that event. Lightnen up e'man..have a larf..ya pompus ponzi posers..